Here is our list of the best DIY Outdoor Christmas Home Decor Projects. Seasonal decor is so much fun, my favourite is decorating the outside of my home. If you follow our blog you’ll know that one of my favourite things to do during the Christmas season is to see all of the decorations and lights. It gives me inspiration and ideas too! 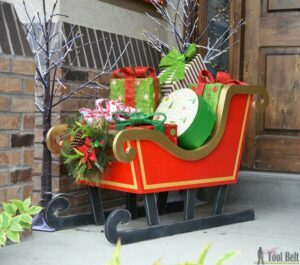 Let’s take a look at some of the Best DIY Outdoor Christmas Decor Projects you can make for your home. These Large Christmas Light Balls by Christmas Lights, Etc. 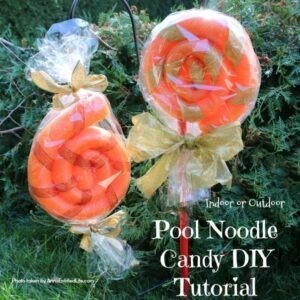 are just amazing and not overly difficult to make. There’s a great material list and tutorial too, so you won’t get stuck along the way! Check them out, they would make any home stand out. This Christmas Topiary by That Village House certainly stands out! I haven’t seen a topiary like this and I’m planning on being the first in my town to do it. 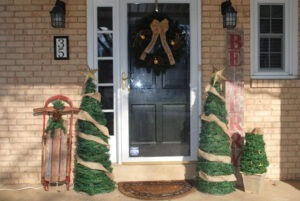 This outdoor Christmas decor project is easy to make, check it out! Bright and cheery, the kids will love to help make this outdoor decor! It may not last all season but it will have your guests smiling when they come to your door. See the easy tutorial by And Then Home. Two it Yourself has created these beautiful Tomato Cage Christmas Trees and has a tutorial too! 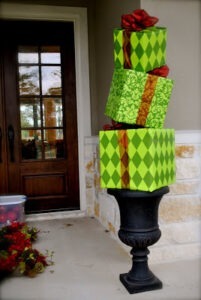 These will look great beside any front door, accented with decorations or left simply in green. Another awesome tutorial by Christmas Lights, Etc. I have seen a few of these pallet lighted Christmas tree’s around town and they are fantastic during the day and night. Put this project on your to-do list! This is a sparkly wintery coloured decor project. 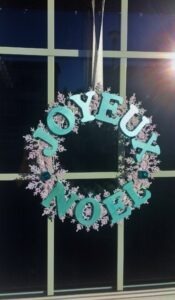 Easy to make and looks beautiful in the sunlight, this wreath by And Then Home is a bright and beautiful addition to outdoor Christmas decor. These simple Starburst Ornaments are fast, inexpensive and totally awesome. 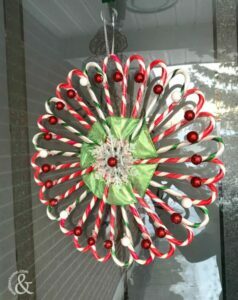 Made by Listotic, these ornaments look best hanging from a large evergreen! 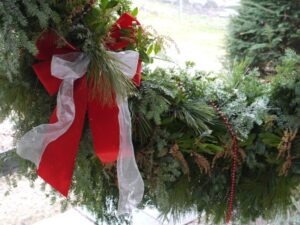 Made by Learning and Yearning, this wreath is made with real evergreen foliage and it’s a statement piece! Big and beautiful, save the money on a pre-made wreath and begin a tradition of creating your own. Designed by Her Tool Belt, this Santa Sleigh is too cute! It will take some time but the finished product is well worth it. The bright colours and shiny accents make this project a must do! Hope you found something you’re anxious to make!! Love this list? The countdown is on, time to start thinking about creating some DIY Christmas home decor! !